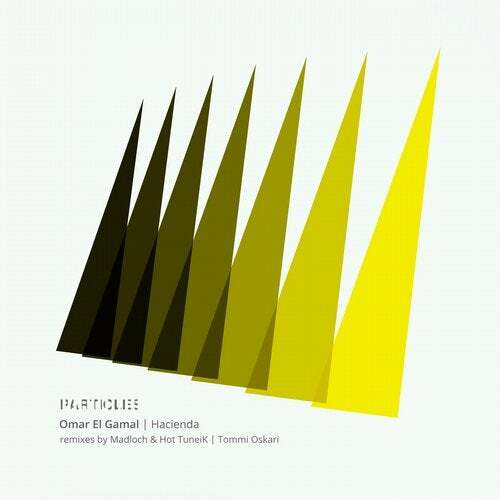 As 2014 drew to a close, Omar El Gamal continued to build upon his portfolio of carefully constructed original works with the immaculate "Hacienda" EP for Particles. Now returning to the label after a seven-month hiatus, both tracks now receive remixes courtesy of debutants from Finland, Belgium and Mexico. From the medieval city of Turku, on the southwest coast of his home country, Finnish producer Tommi Pirinen has carved out a considerable niche for himself using his Oskari production name and 2011's "Dream Beater" debut for Architronica. With a penchant for "the smooth vibes of deep house to driving progressive tech house and techno", the Finn has demonstrated a mastery of production styles that have seen subsequent releases on Juicebox, Lowbit and BC2. Furthermore a remix of Sonic Union and Khen's "Introspection" for fellow countryman Cid Inc.'s Replug, is a notable highlight in an expanding career. Now making his Particles debut, the Tommi Oskari remix of "Paradiso" is a chugging, rhythmic affair that evolves through its seven-minute journey with a poise and grace that is an equal to the original. Using Omar El Gamal's original components as a foundation, additional production sees a gated synth sequence provide a hypnotic layer of intrigue in a work of considerable skill. In the small town of Tongeren, the oldest in Belgium, Dominique Heyninck has extended his influence far beyond the borders of his home country. Through his Madloch production pseudonym and a triumvirate of labels that include Sound Avenue, Crossfade Sounds and 3rd Avenue, Madloch has provided the underground music scene with a galaxy of releases from high-profile artists supported by the likes of Jon Digweed, Hernan Cattaneo and Eelke Kleijn and featuring in a monthly show on Proton Radio. As a producer and DJ, Forward Music, Visceral and Agara have found a home to the Madloch sound alongside a quarter century of credits on Sound Avenue. Joining forces with Mexican producer Hot TuneIK who has provided material for both Sound Avenue and 3rd Avenue in 2015 thus far, the pair have conjured up a magical interpretation of "Hacienda". Retaining key melodic elements from the Omar El Gamal original, the Madloch and Hot TuneIK remix rises in intensity through warm grooved bass line and driving percussive rhythms. Full of dance floor sensibilities and flawless additional production, the duo's remix is a glossy, intelligent production that oozes quality from every bar. With a pair of remixes from Tommi Oskari and Madloch and Hot TuneIK, Omar El Gamal has seen a new order established with the revitalisation of his "Hacienda".